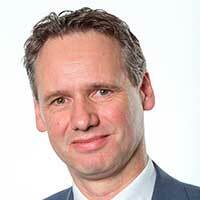 Peter de Bruijne serves as the managing director of msg global solutions Benelux B.V. In this role, he is responsible for the firm’s overall operations management, business development and business consulting efforts. Peter joined msg global solutions from outsourcing firm Genpact Netherlands and brings a wealth of diverse strategic consulting experience to his position within the insurance, oil & gas, and logistics interests in the region. Along with deep expertise in project management, business consulting and outsourcing, Peter has more than 23 years of experience in IT (21 of those successfully working with SAP implementations such as SAP for Insurance and SAP Logistics), including design, optimization and implementation of IT processes. With specific expertise in product modeling, data migration and security/authorization management, Peter has a strong consulting and project management background, having helped customers in The Netherlands, Belgium, Germany, Switzerland, France and Saudi Arabia solve difficult business issues with the right mix of innovative technology and processes. In the European insurance market, Peter successfully relies on his close network connections and hands-on consulting experience at some of the major insurance companies in EMEA.